ProLite Knee Support Knitted Pullover, manufactured by FLA Orthopedics, delivers excellent compression and stabilization for unsteady or injured knees. 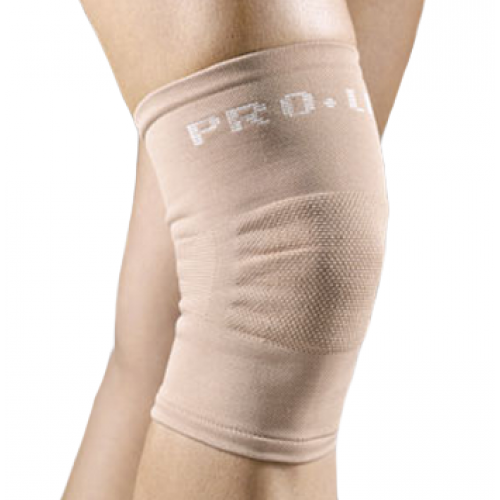 This knee compressive sleeve is made of stretch knitted Lycra, also known as spandex or elastane, and nylon. The combination of these two fabrics makes this compressive sleeve lightweight and breathable compared to alternatives choices made with neoprene. The Lycra, additionally, is what delivers the precise compressive support, while simultaneously sustaining flexibility. Offering an easy application process, you can quickly and easily slip this over your leg and knee. Buy now and start receiving therapeutic compression on your weak or injured knee today! However, if this knee support does not meet your rehabilitative needs, make sure to check out some of our other selection of knee supports, such as this knitted knee support and knee support, here. Product Numbers: 37-400SMBEG, 37-400MDBEG, 37-400LGBEG, 37-4001LBEG, 37-4002LBEG, 37-400SMSTD, 37-400MDSTD, 37-400LGSTD, and 37-4001LSTD. Sizes: SM, MD, LG, XL, and XXL. Application: To deliver support to your knee. To properly determine which size you need, measure the circumference of your leg 4 inches above the center of your knee cap. Extra Large 17.5 - 19"